The steamboat Bertrand, carrying cargo up the Missouri River to Virginia City, Montana Territory, sank on April 1, 1865, after hitting a snag in the river north of Omaha, Nebraska. J.C. Penny said that salesmanship is an art. Aside from P.T. Barnum, one would be hard pressed to find a more aggressive marketer than Patrick Henry Drake. 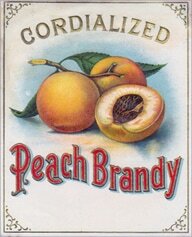 In 1861, he formed a partnership with Demas S. Barnes, of New York City. Barnes was the largest wholesale drug dealer in New York City, and his list of occupations include, banker, newspaper publisher, real estate developer and in 1867, he was elected to the 67th congressional district from Brooklyn. After the war, Barnes built an empire by buying the rights to other patent medicines. 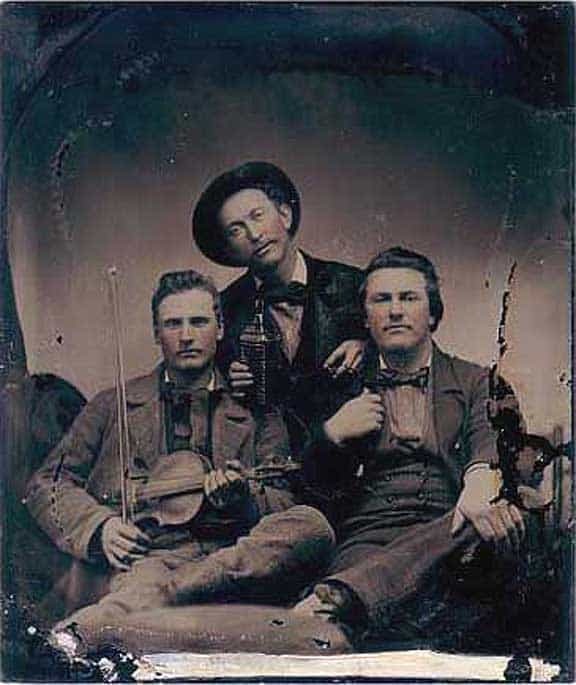 One can only picture these three gentlemen enjoying their bottle of Drake’s Plantation Bitters that was carried up on the steamship Bertrand to Virginia City, Montana Territory. 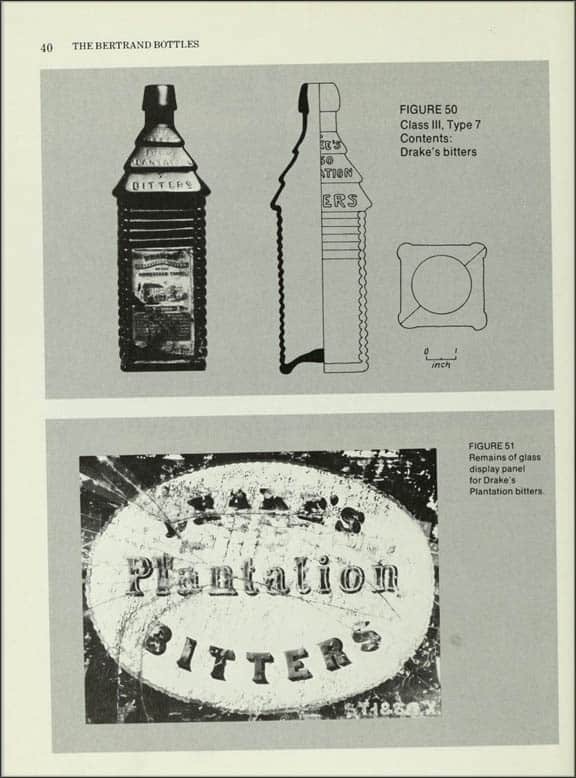 Drake obtained a patent for his bottle design in 1862, using the log cabin theme of his bottle design to characterize the Plantation Bitters he produced. Calling himself Colonel Drake, he was an aggressive self promoter, and included advertising signs, in every crate shipped to retailers. The crates salvaged from the riverboat Bertrand contained gilded glass signs promoting his bitters. He had his slogan S.T. 1860 X, painted on rocks, fences and sides of barns. He advertised in about any newspaper that sold space, and had even unsuccessfully tried to have his S.T. 1860 X slogan painted on Niagara Falls, Mount Ararat and even the pyramids in Egypt. The cryptic slogan really locked the product into the mind of the public, bringing speculation as to its meaning. Drake had his slogan S.T. 1860 X, painted on rocks, fences and sides of barns. He advertised in about any newspaper that sold space, and had even unsuccessfully tried to have his S.T. 1860 X slogan painted on Niagara Falls, Mount Ararat and even the pyramids in Egypt. 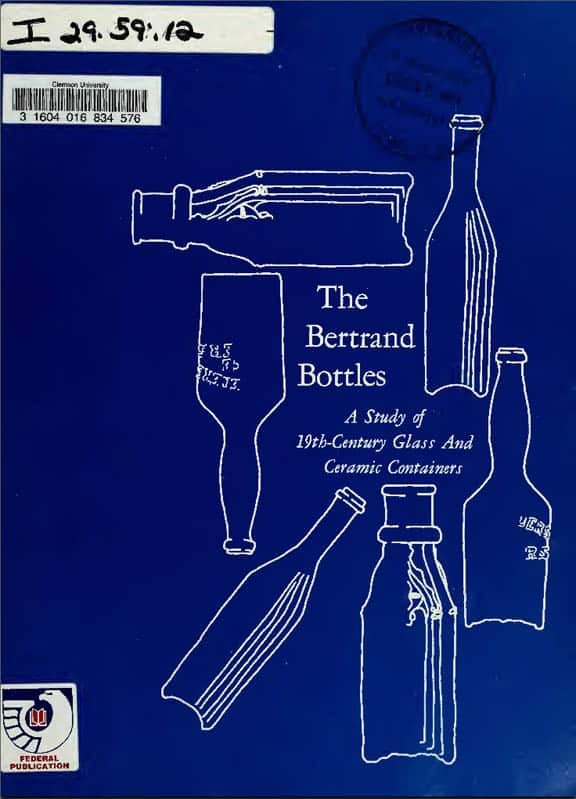 This book pictured below, published by the National Park Service (Department of Interior) in 1974 is one of the classic works in the field of historic archaeology as it pertains to bottles. I thoroughly enjoyed it and have pulled and highlighted some areas of interest relating to bitters bottles. Dr. Jacob & David Hostetter. Of greater fame in the mid-19th century was Dr. Jacob Hostetter and his son David. Dr. Hostetter was a prominent Pennsylvania physician who, for a number of years, had prescribed a tonic of his own formulation for his patients. In 1853 David Hostetter adopted his father’s prized prescription to concoct the famous “Hostetter Stomachic Bitters.” The tonic was sold successfully under the trademark “Hostetter & Smith,” registered under numbers 3, 135, 223 and 8,970 in the United States Patent Office between July 4, 1859, and December, 1884, when the trademark was changed to “Hostetter & Co.” This same trademark, which incorporated the use of specific labels, was declared again on August 9, 1888 and was registered as Number 15,873 by the United States Patent Office on September 18, 1888. 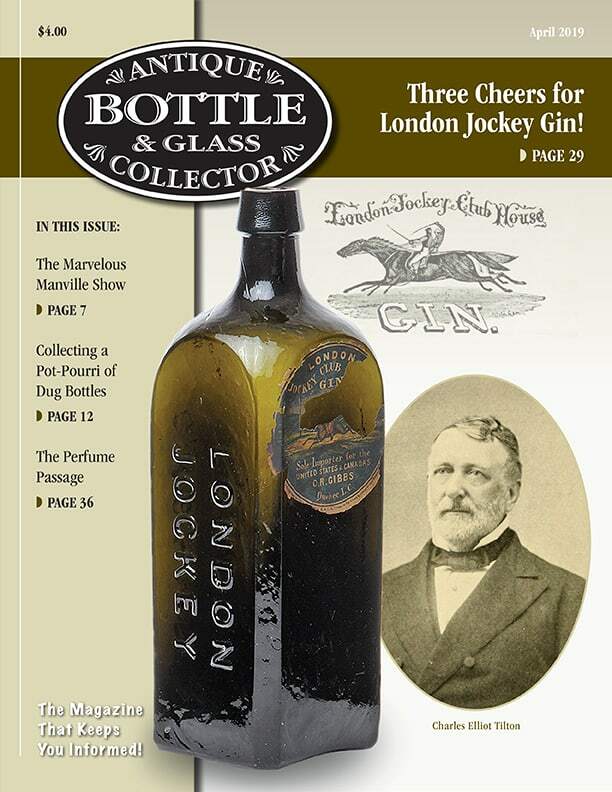 Between 1889 and 1920, the Hostetter Company was selling bitters all over the world, backed by an advertising campaign that cost $4,425,000 in the 30-year period. 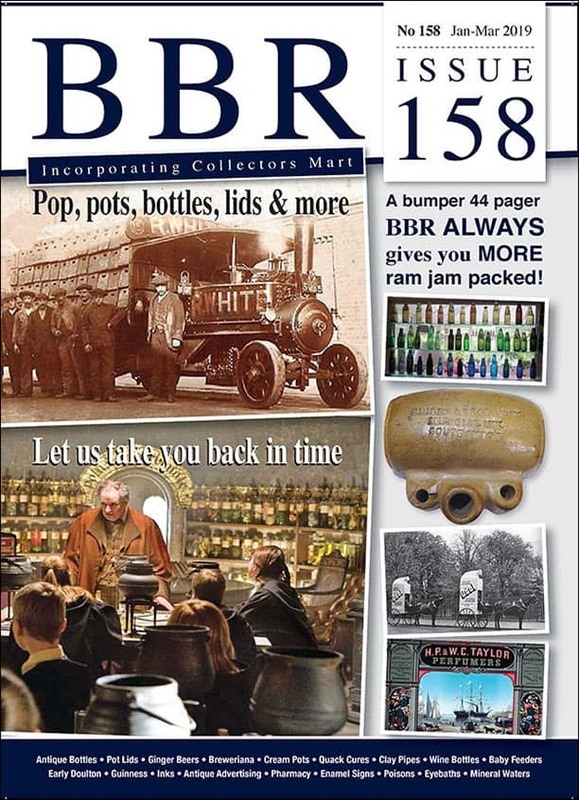 Most of the advertising took the form of regularly published almanacs. Nux Vomica seed (Strychmos Nux vomica) 8.00 m.
Oil of Orange 0.5 m.
Nux vomica or strychnine is readily identifiable as a poisonous, colorless, crystalline alkaloid which is used in small doses as a stimulant to the nervous system. Cinchona bark is a bitter alkaloid with various medicinal properties; from it quinine is extracted. Anise is a small white or yellow flowered plant of the carrot family whose seed is used primarily as a flavoring, while calamus, sometimes called “sweet flag” is a palm-like plant. The purpose of the latter in the formula is not known. Ginger, of course, is a tropical herb whose rootstalk is used as a flavoring and in medicines. The other ingredients need no explanation. 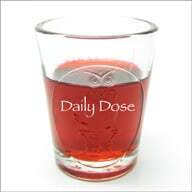 A wine-glass full of these Bitters taken three times a day, will be a sure cure for Dyspepsia, will remove all flatulency; assist digestion; give a good appetite, and impart a healthy tone to the whole system, and is a certain preventive of fever and ague. Children, delicate ladies, or persons in a debilitated state should try a bottle. The U.S. Army abolished the liquor ration for troops in 1832. When the Civil War began, Hostetter and other makers of patent medicines urged their products on the Federal government for use by the military. Hostetter deplored the use of common whiskey by officers in the field, believing that his concoction of bitters was better for their health and morals (Carson, 1961, p. 49; Lord, 1969, p. 52). His advice on the subject of bitters was doubtless followed with enthusiasm by northern soldiers, a condition which more than made up for the loss of most of his southern market. 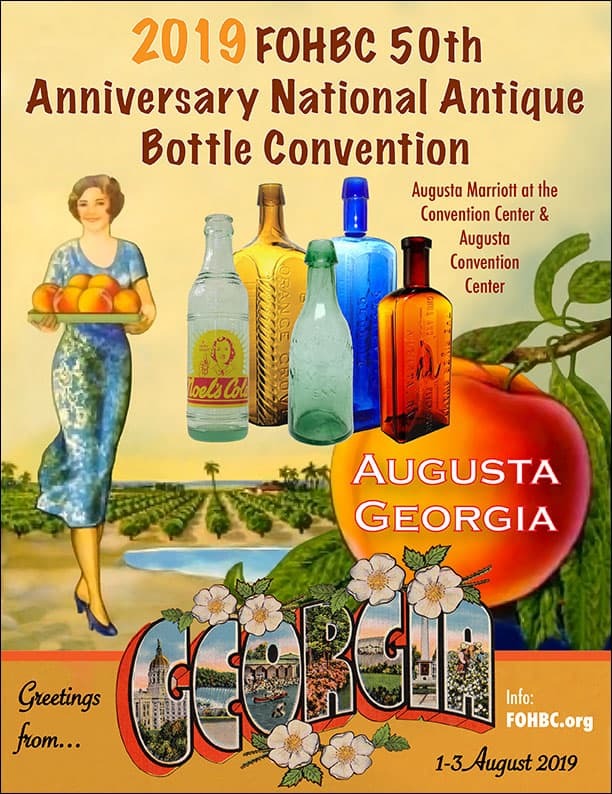 When alcohol was allocated during World War I, Hostetter and Company suffered severe financial difficulties from which it never fully recovered. However, in 1902 Hostetter was listed as one of 3,045 certified millionaires in the United States, and is said to have made something in excess of $18 million from his celebrated tonic (Carson, 1961, pp. 42, 73). 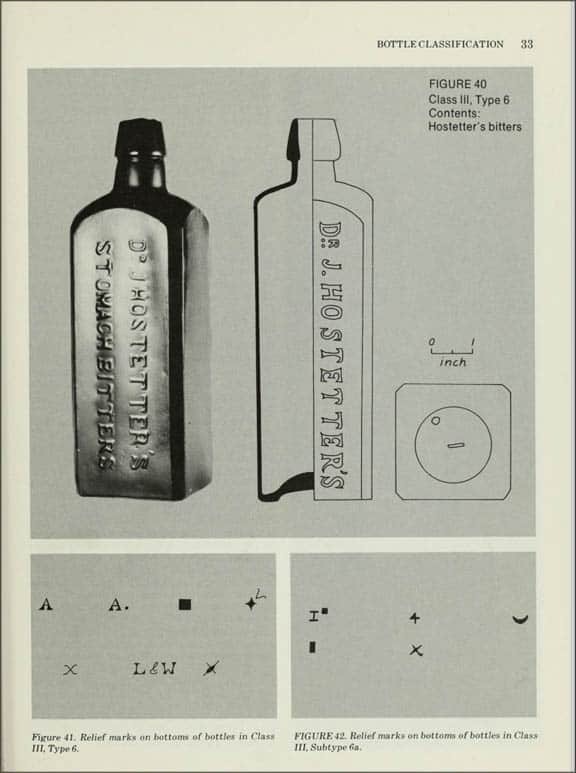 In 1959 the State Pharmacal Company of Newark, New Jersey, a wholly owned division of Hazel Bishop Incorporated, Union, New Jersey, purchased the trademark and business of Dr. Hostetter‘s Stomachic Bitters. The trademark is still owned by that firm and is listed by the United States Patent Office under Serial Number 76,604, filed June 26, 1959 and registered May 24, I960 (No. 698,028); the product is no longer made. The dark amber and dark green Hostetter‘s bitters bottles represent the largest single category of bottles with alcoholic contents. 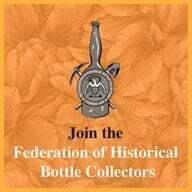 One hundred and ninety-one, 12-bottle cases of Hostetter‘s bitters in two sizes of bottles have been counted in the collection. The average alcohol content is 27 percent by volume, which is somewhat greater than the original Hostetter formula. 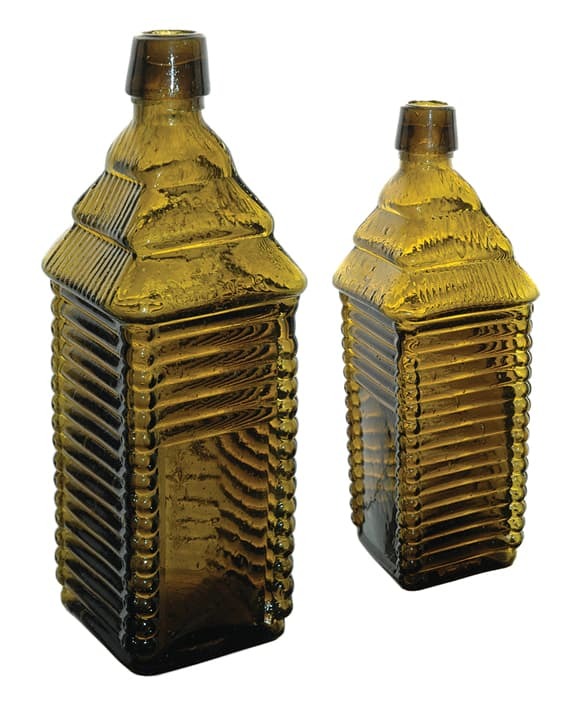 The small, amber, 22-ounce bottles in Type 6 were blown in two-piece molds and have slanting collar neck finishes (fig. 40). Bottle bases are flat and exhibit shallow dish-shaped depressions at the centers. Some of the bases have relief marks. Apparently, the “L&W” mark should be attributed to the Lorenz and Wightman firm who operated the Pittsburgh Glass Works. “DR. J. HOSTETTER’S / STOMACH BITTERS,” and were stoppered with corks. The bottles also display fragments of paper labels on two sides. These are described below with Subtype 6a. Dimensions, Type 6: height, 8 7/8 inches; base, 2 5/8 by 2 5/8 inches; diameter of neck (outside), 1 1/8 inches, (inside), 3/4 in. Bitters bottles in the Subtype 6a category are dark green or amber in color and are similar morphologically to Type 6 except that they have a greater capacity of about 28 ounces. The bottles contain cork stoppers, covered with thick foil seals. Over the tops of the seals. 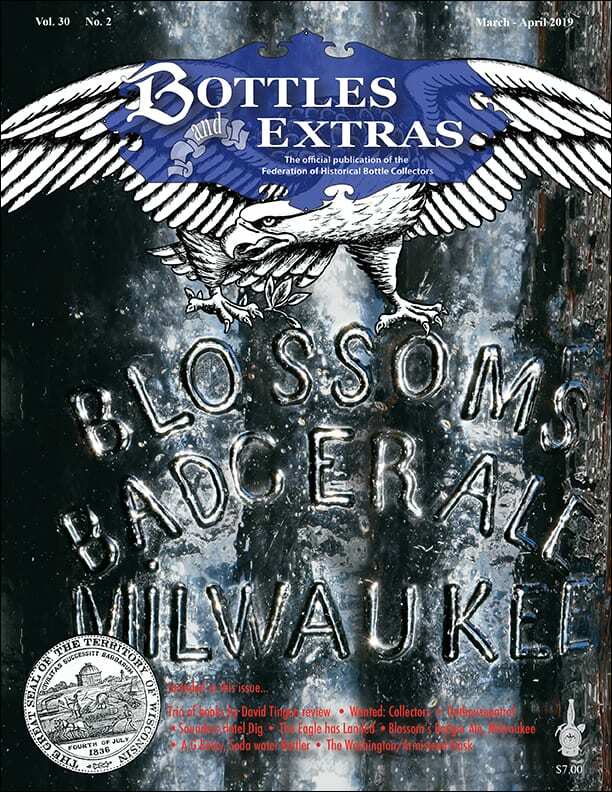 A dark blue paper label with gold (now gray) print was affixed to one side of a bottle and the opposing side displayed a label with black print on a white background. The upper half of the black and white label depicts St. George slaying the dragon. Dimensions, Subtype 6a: height, 9 5/16 inches; base, 2 3/16 by 2 3/16 inches; diameter of neck (outside), 1 1/16 inch, (inside), 3/4 inch. One wine-glassful taken three times a day before meals, will be a swift and certain cure for Dyspepsia, Liver Complaint, and every species of indigestion – an unfailing remedy for Intermittent Fever, Fever and Ague, and all kinds of periodical flux, Colics, and Choleric maladies – a cure for costiveness – a mild and safe invigorant and corroborant for delicate females – a good, anti-bilious, alternative and tonic preparation for ordinary family purposes – a powerful recuperant after the frame has been reduced and altered by sickness – an excellent appetizer as well as a strengthener of the blood and other fluids desirable as a corrective and mild cathartic and an agreeable and wholesome stimulant. Persons in a debilitated state should commence by taking small doses and increase with their strength. “HOSTETTERS / STOMACH / BITTERS / BARSTORES / BERTRAND.” The dark green and amber bottles, designated as Subtype 6b have no raised letters on their sides, but otherwise they are like the bottles in Subtype 6a. Dimensions, Subtype 6b: height, 9 3/4 inches; base, 2 7/8 by 2 7/8 inches; diameter of neck (outside), 1 1/16 inch, (inside), sealed. Larger Hostetter‘s bottles are definitely in the minority, and, at this writing, no more than two cases have been found. Perhaps others will come to our attention as work progresses in opening the crates. “HOSTETTER & SMITH / SOLE / MANUFACTURERS / &/ PROPRIETORS / PITTSBURGH, P. A.”; consignee: “VIVIAN & SIMPSON / VIRGINIA CITY, M.T..” Inside many of the cases were eight almanacs packed in sets of two, or twelve almanacs packed in four sets of three. Over the almanacs large folded Hostetter broadsides had been placed, one per box. The broadsides are lettered in bold reddish-brown print, and at the center of each is a woodcut in black of St. George slaying the dragon. 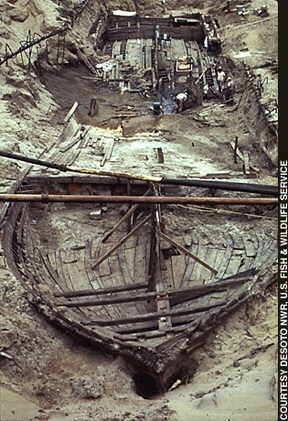 Unfortunately, not one complete broadside has been recovered. Fragments pieced together in the Bertrand Conservation Laboratory indicate that they measured 18 by 24 1/2 inches. Another famous name in proprietary medicines of the 1860’s and represented in the Bertrand cargo is that of Colonel P. H. Drake. 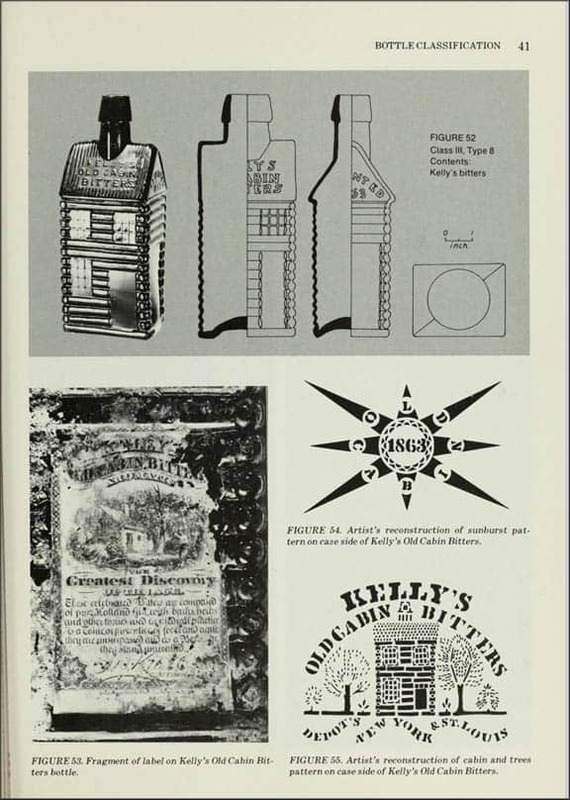 If Colonel Drake’s Plantation Bitters looked and tasted like whiskey, it was because it was just that, or, more specifically, St. Croix rum (Carson, 1961, p. 45). This “nutritious” essence, which was derived from sugar cane and bittered with barks and herbs, made its appearance during the Civil War when there was a high excise tax on whiskey. Colonel Drake is said to have spent a great deal of money on advertising and went to great lengths to promote his product. 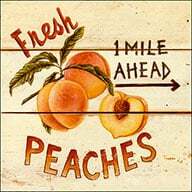 His mysterious advertising jargon containing the letters and figures “S. T. 1860 X” appeared on fences, barns, billboards and rocks around the world. Drake, as some historians have it, even tried to paint his slogan on Mount Ararat, Niagara Falls, and on the famous Egyptian pyramids, but he was unsuccessful in all three ventures (Carson, 1961, pp. 42, 92). 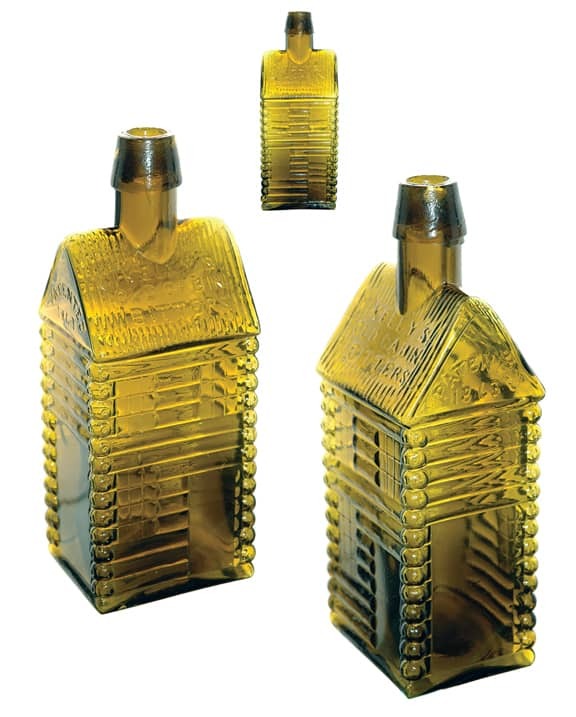 “S T / DRAKES”; middle: “1860 / PLANTATION”; bottom: “X / BITTERS.” The middle tier of the reverse side is embossed: “PATENTED / 1862.” The two remaining sides are molded to represent logs, which cross at the corners of the bottles, and the tiered roof above is corrugated. The necks are cylindrical and terminate in slanting collar finishes. On each bottle the edge of the base is flat and the center of the base bears a plain dished depression. All of these speci-mens were stoppered with corks. In many instances fragments of black-on-white paper labels were found adhering to the front and back panels. Some bottles show evidence of having been wrapped in a black and-white printed paper wrapper bearing testimony of the effectiveness of the tonic. 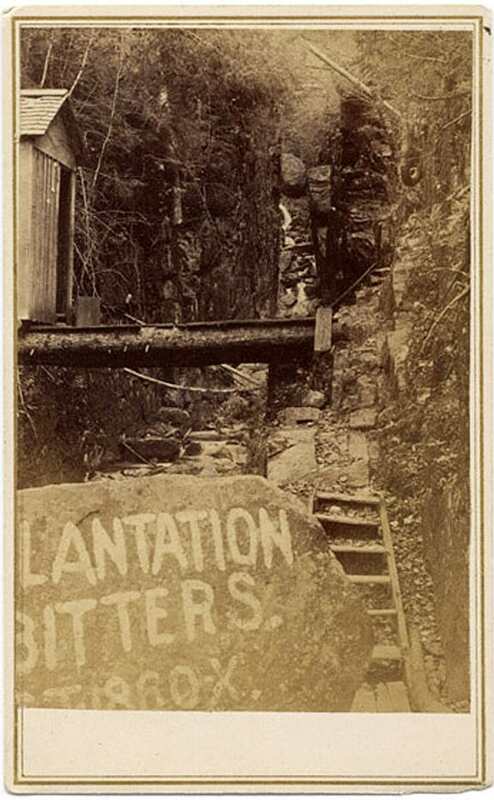 “DRAKE’S PLANTATION BITTERS / DEPOT NEW YORK,” or “S T 1860 X / G / G T & S / WITH CARE VIA SARNIA”; consignees: “WORDEN & CO / HELL GATE, M.T.,” or “VIVIAN & SIMPSON / VIRGINIA CITY, M.T.” Dimensions, Type 7: height, 9 7/8 inches; base, 2 3/4 by 2 3/4 inches; diameter of neck (outside), 1 1/16 inches, (inside), 13/16 inch. sides bear plain panels for labels, topped with five relief logs and a triangular-shaped space under the pitch of the roof embossed: “PATENTED / 1863.” The bottle necks are cylindrical. “WORDEN AND CO. / HELL GATE”; or, “FROM / H. A. RICHARDS / WASHINGTON / 57, / BOSTON / GIN COCKTAIL / WORDEN AND CO. / HELL GATE. ; Dimensions, Type 8: height, 9 1/8 inches; base, 2 3/4 by 3 7/16 inches; diameter of neck (outside), 1 inch, (inside), 3/4 inch. Not a great deal is known about J. H. Schroeder, other than the fact that he produced bitters, probably made with catawba wine. He was a dealer in wines, liquors and general bar stores. 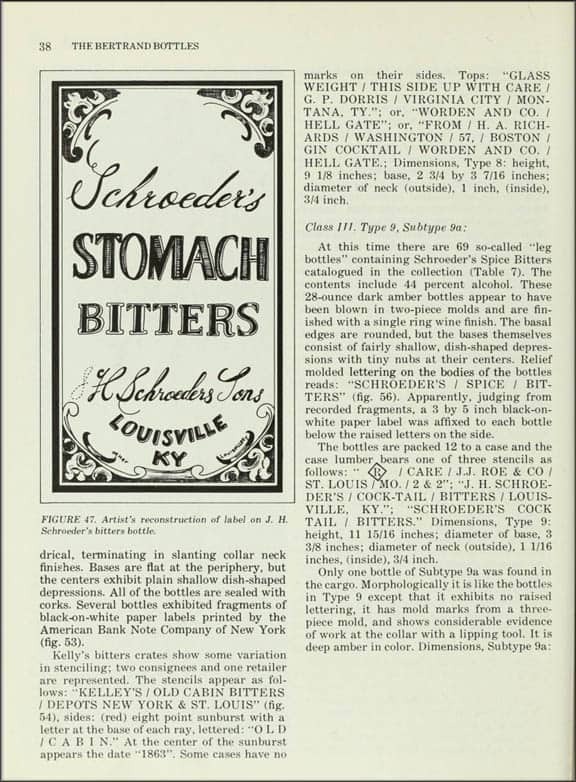 The Louisville Business Mirror for 1858-1859 (p. 281) includes an advertisement for the Schroeder business. Louisville printed no directories during the Civil War, but by 1864 the firm was again listed on Wall Street as “J. H. Schroeder and Son.” In 1865 the business moved to Main Street, Louisville (Martin F. Schmidt., Louisville Free Public Library, personal communication, 1971). 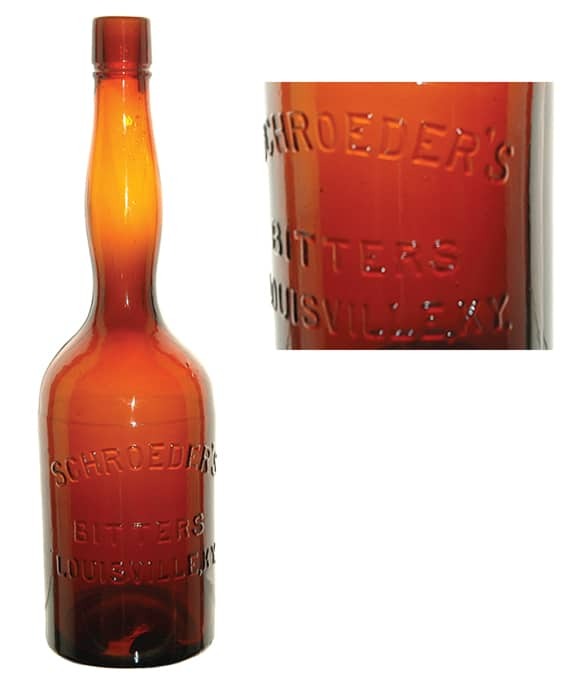 Neither the Schroeder’s Spice Bitters nor the Schroeder’s Stomach Bitters bottles in the Bertrand cargo were embossed on the bases with letters, but presumably they were products of the Kentucky Glass Works Company of Louisville. The firm was established in 1849 by Taylor, Stanger, Ramsey and Company and was sold the following year to George L. Douglass and James Taylor (McKearin and McKearin, 1971, p. 606; Toulouse, 1971, p. 323). 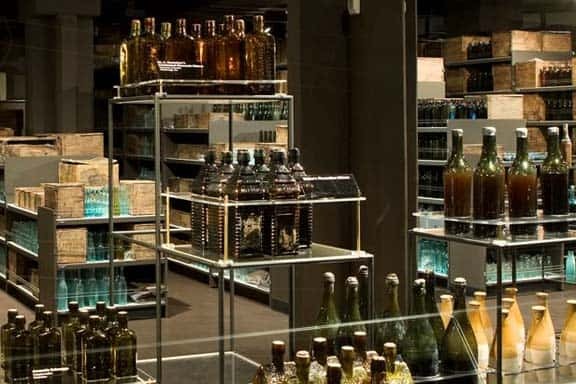 The factory produced vials, demijohns and bottles of other kinds, including some made in private molds. By 1855 the factory had been purchased by Douglas, Rutherford & Company, and the name had been changed to Louisville Glass Works. Ownership of the Louisville Works changed again in 1856 and 1865 and thereafter about every two years until it closed in 1873. However, according to Toulouse (1971, p. 324) the shop was purchased and reopened that same year by Captain J. B. Ford, who operated it as the Louisville Kentucky Glass Works until about 1886. There is no way to determine exactly when the Schroeder’s bottles on the Bertrand were made. Between 1849 and 1855 the company used the marks “K Y G W,” but it may have used others, including “KY G W Co,” about which we have no information. 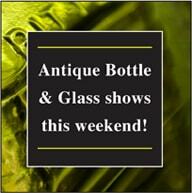 By 1870, if not eariler, their bottles were marked “L G W” to reflect the change in the company name in 1855. 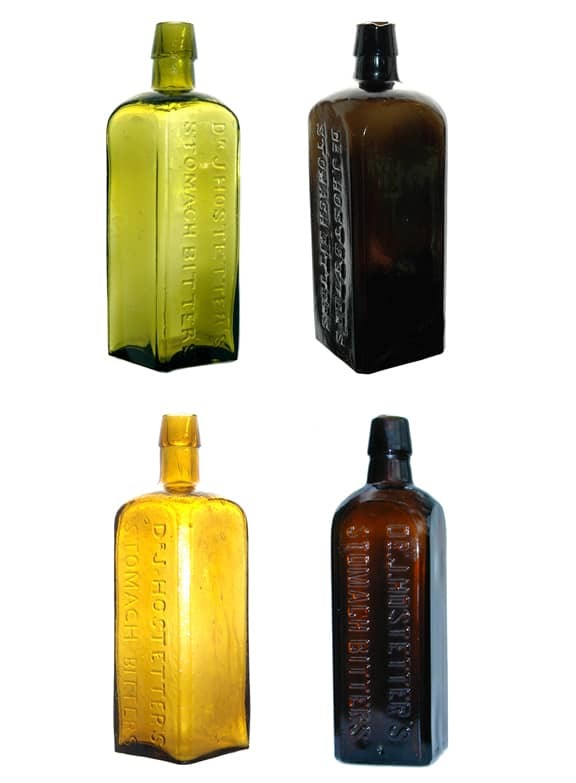 Inasmuch as the firm did considerable business in bottles made in private molds it is not unreasonable to assume the Schroeder’s Spice Bitters bottles and the “French square” Schroeder’s Stomach Bitters bottles are two such products. “SCHROEDER’S / SPICE / BITTERS”. Apparently, judging from recorded fragments, a 3 by 5 inch black-on-white paper label was affixed to each bottle below the raised letters on the side. “/ CARE / J.J. ROE & CO / ST. LOUIS MO. / 2 & 2”; “J. H. SCHROEDER’S / COCKTAIL / BITTERS / LOUISVILLE, KY.”; “SCHROEDER’S COCKTAIL / BITTERS.” Dimensions, Type 9: height, 11 15/16 inches; diameter of base, 3 3/8 inches; diameter of neck (outside), 1 1/16 inches, (inside), 3/4 inch. Only one bottle of Subtype 9a was found in the cargo. Morphologically it is like the bottles in Type 9 except that it exhibits no raised lettering, it has mold marks from a three-piece mold, and shows considerable evidence of work at the collar with a lipping tool. It is deep amber in color. Dimensions, Subtype 9a: height, 11 3/4 inches; diameter of base, 3 1/2 inches; diameter of neck (outside), 1 1/8 inches, (inside), 3/4 inch. Eleven pewter dispenser caps for Schroeder’s bitters bottles have been identified in the Bertrand collection, only one of which was found in direct association with Schroeder’s bottles. “J. H. SCHROEDER / 28 WALL STREET / LOUISVILLE, KY.” Dimensions, Subtype 6c: height, 9 15/16 inches; base, 3 1/16 by 3 1/16 inches; diameter of neck (outside), 1 inch, (inside), 3/4 inch. 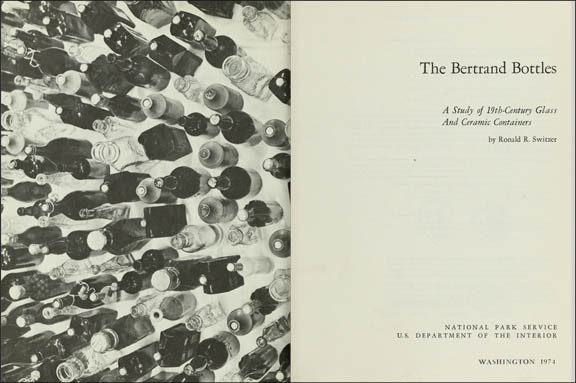 This entry was posted in Bitters, Digging and Finding, Figural Bottles, History, Museums, Publications, Treasure and tagged Bertrand, bitters, cabin, Celebrated, Demas S. Barnes, Drakes, Hostetter's, Jacob Hostetter, Kelly's, Missouri, Montana, Nebraskaa, omaha, Patrick Henry Drake, Plantation, Schroeder, Steamboat, Stomach, Virginia City. Bookmark the permalink. talk about a dream dig, could you imagine? The book is a must have, loading with information and detailing the dig which sounds more like fantasy then non fiction! If you have a Schroeder’s SPICE Bitters. call ME, not Ferdinand Meyer or Bill Taylor!